Looking for a hotel in Carlsbad, California? West Inn and Suites is one of my favorite hotels ANYWHERE. Here’s why. 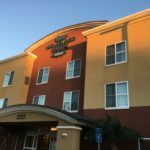 We stayed at the highly rated West Inn during a family trip to the San Diego area, and the comfort and service were indeed superior to comparable hotels we have visited. I especially liked the long list of complimentary amenities and thoughtful details that are included at no extra charge. Here is why we would return to West Inn on our next visit to Carlsbad. Every room at the West Inn has king-size beds – a rare treat in a family-sized hotel room. We stayed in a Double King Suite, which had two king-size beds, plus a separate sitting area with a second television and pull-out couch. A family of six would comfortably fit in this suite. Complimentary cribs are also available for families with young children. Our room had a refrigerator, microwave and small sink. The decor was fresh and stylish, with interesting touches such as a sea shell on a ribbon printed with “Do Not Disturb” instead of the usual plastic door hanger. The common areas of the hotel were even decorated for Halloween. My kids cannot get enough pool time when we travel. So, we carved out a couple of hours after breakfast one morning for them to enjoy the pool at the West Inn. I expected that the outdoor pool would be chilly on a fall morning, but I was pleasantly surprised to find that the pool temperature was perfect. We enjoyed citrus water, magazines and pool toys that were set out near the pool towels. The West Inn provides also complimentary swim diapers at the pool for guests with young children. The West Inn offers lots of fun amenities for families. Cookies and milk are provided in the lobby each evening. Guests are welcome to borrow movies and board games from the front desk and enjoy them in the hotel’s family room or in their own rooms. Coin-op guest laundry, specialty concierge services, free parking, wireless internet are also included. The West Inn and Suites is pet-friendly, for an additional charge. It even has its own dog park and a Canine Cuisine room service menu. The West Inn has two on-site restaurants, West Steak and Seafood and Bistro West. We dined at Bistro West one night and had a good experience with our children there. It’s a little swankier than the places we usually dare take them, but the atmosphere is casual – imagine an upscale sports grill – and they liked the kids’ menu, which includes cheeseburger sliders, pizza and grilled cheese sandwiches. I liked that everything at Bistro West is made from scratch with high-quality, farm-fresh ingredients. Carlsbad has many other good restaurants, including local favorites and familiar chains, which be found within a mile or two of the hotel. Check with the front desk or family concierge for directions or a recommendation. So, I ordered my dog the veggie burger through Canine Cuisine for dinner. My daughter and I took a bite… delish! I tried to feed him breakfast in the morning and he looked at me like I was crazy. Room service spoiled him, totally. I feel this hotel is extremely good value for money because of included amenities and the rooms are so nice! I love that you tried your dog’s meal! I understand that the Canine Cuisine comes from the same chef and the same farm fresh ingredients as the rest of the menu at the West Inn, so I’m sure it was delicious. I agree that the West Inn offers great value. It is a little more expensive than some of the familiar chains nearby, but few of them offer the same amenities and comfort for under $200 per night. You KNOW how I feel about West Inn and Suites since I recommended this hotel to you! It’s SUCH a fab place for families. Truly, I recommend them all the time (obviously!). It’s true. I owe you, Colleen! We stayed at this hotel in March of 2013 and loved it! We were too busy to spend a lot of time at the hotel but we really enjoyed the room and the breakfast the days we were there!